Permission is granted to make and distribute verbatim copies of this document for non-commercial private research purposes provided the copyright notice and this permission notice are preserved on all copies. Website mirroring is permitted by express prior arrangement. Permission will only be granted if the document is posted in its entirety and the content and format of the document remain completely unaltered by the mirroring site. The definitive version of this document can be found at http://www.shelaghlewins.com. Copyright © 2003 Shelagh Lewins. The "signature" Viking woman's garment was a sleeveless overdress worn with a pair of oval or animal-headed brooches. It fastened the dress like the buckles on a dungaree skirt. We don't know the Old Norse word for it, so it's referred to by a number of names, including Hangerock (hanging skirt), apron-dress, and Trägerrock (pinafore). The brooches have been found in wealthy women's graves across most areas of Viking occupation, and are thought only to have been worn with apron-dresses. Although the apron-dress became unfashionable in the later part of the Viking age, it is very popular with re-enactors because it is so clearly Viking, and allows one to wear nice big shiny brooches of bronze, silver or gold-plated bronze. So what was the apron-dress like? Unfortunately archaeological textile finds tend to be few and far between. There are no clear contemporary pictures of the apron-dress. The best preserved find of an apron-dress is from Haithabu (Hedeby harbour), where old garments were used to caulk ships which were subsequently sunk. Hedeby is now in Germany, and is near the Danish border. The finds date from approximately the 10th century AD. Although it is not a complete dress, it tells us a lot about the apron-dress as worn in this particular time and place, and helps to devise a plausible reconstruction. The account of the Hedeby harbour finds has only been published in German . The following article is an annotated summary of Inga Hägg's report on the Trägerrock. The report was translated by Rachel Kellett, and the summary written by Shelagh Lewins. The notes at the end are additional comments by Shelagh Lewins. Illustrations: Shelagh Lewins, based on those in the original book. Thanks to: Lena Strid for assistance with translation and further information. The two fragments from this garment were of fine, repped cloth which had been dyed brown . Figure 1 shows the weave of the cloth. 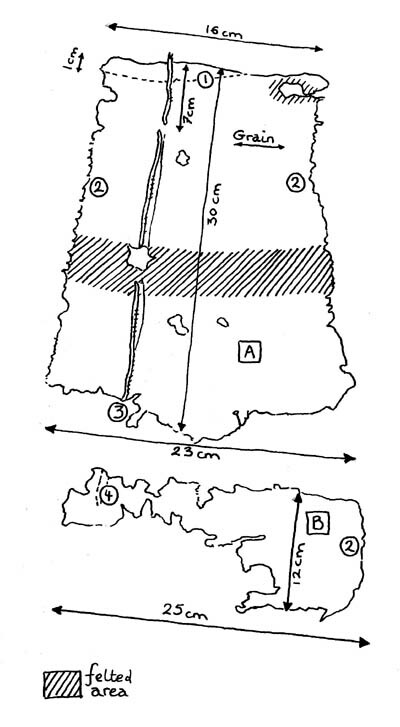 The top seam of Fragment A (1 on Figure 2) was made by turning a selvedge over and sewing it down (see Figure 3). There is a hole in the seam with a felted area around it. Both side seams (2 on Figure 2) show regular stitch holes where this fragment was attached to other panels of the garment. A dart runs most of the length of the garment, from 7 cm below the top seam, down to the Fragment B (3 and 4 on Figure 2). Over it is sewn a piece of braid, now 1-2 mm wide, which extends beyond the dart up to the top edge . It is made of six threads, three red and three yellow. This braid has deteriorated considerably, but seems to have been made up of six threads, three red and three yellow. These have been twisted together in pairs and the three strands plaited. See Figure 4 . The dart's widest point (5 mm) is about 15 cm below the top edge of Fragment A, and at this point there is a hole worn in the cloth. There is a band of felted cloth across the fragment at this point. Fragment B is torn top and bottom, but the sides show the same stitch-holes as on the top piece. There's no braid on the section of the dart which appears in the lower piece. The shape and cut of the pieces identifies them as coming from a pinafore-style dress. From the dart and the way the top seam is made, this was the outer layer of the garment. The shape of the dart, deeper in the middle than that the edges, shows this was not a sleeve or other item. The widest point of the dart would sit on the waistline (see Figure 5). From the felting and the hole, it seems that a belt was worn over the dress. The hole at the top, probably caused by wear, may have been used to attach the shoulder strap. This strap may have been passed through the hole and knotted. The Haithabu harbour fragments are among several similar Viking-age finds: the others are less well preserved. Women's graves in Vernes, Sandanger and Kaupang in Norway, and several sites in Sweden (mostly Birka) have yielded fragments of woollen pinafores, and also linen fragments, though these are in worse condition. The biggest and best of the older finds is a woollen piece from grave 597 in Birka (see Hägg 1974, and 1983). The Scandinavian finds have also provided the remains of a hangerock of fine pleated wool, and perhaps also of pleated linen. These finds usually have a simple folded and sewn seam at the neck, or may have decorative braid and loops or tabs for the shoulder straps. These fragments have almost all been accompanied by metal jewellery, showing them to from the front of the garment. However, they don't show any shaping such as in the Haithabu find. Agnes Geijer (1938) thought that the Birka pinafore was a simple rectangle of cloth, worn with straps or tabs sewn to the upper seam. These would have been laid over the shoulders and fastened with oval brooches. This is a generally popular view, and holds that the pinafore was very similar to the Ancient Greek peplos, being a garment made from a piece of cloth unaltered after leaving the loom. However, looking more closely at the Birka fragments, the sides of the woollen dress could have been closed, and the pinafore might be descended from the Huldremose Iron Age dress (see Hägg 1974). This would suggest that the pinafore is not of the primary-clothing type, and that the form was determined by the function. The Haithabu fragments, being larger than previous finds and tailored, allow us to make some further guesses about the pattern which was used to make this garment. The garment would have been made from several pieces of cloth, and brought in at the waist by the narrow cut, the dart and a belt. This shows that the Viking woman's dress had advanced beyond more primitive styles of draped cloth, and that the tailoring techniques were by advanced by this time. The close-fitting panels suggest that the garment may have looked like those from the high Middle Ages, such as the clothing of the Danish Queen Margareta (died 1412). However, her dress had integral shoulder-pieces (see Branting 1911). Decorated seams are also known from Birka (especially on the pinafore, see Hägg 1974), and clothing fragments from Herjolfsnes (compare Nørlund 1924 ). The strands are generally twisted, and more often plaited. The most common are very thin six-stranded plaits whose diameter is approximately. 1 mm. Sadly the Haithabu find doesn't tell us much about the side seams. Geijer thought the dress hung as loosely as a bib from its brooches (Vierck, 1981), so the side seams would have posed no problems to the wearer. However, a dress as close fitting as the Haithabu pinafore seems to have been, would have required an opening in order to put it on. The Old Norse laced dress or dragkyrtill was laced together at the sides (laz ar siþu, Falk 1919, p 158), and our dress may have been similar. It's hard to find definite references to the pinafore in Old Norse: Falk suggests the word "smokkr", from the Old Norse smjœga, "to cling". Rigsm. 16 says "the sleeveless garment was fastened on the shoulders with brooches" (Blindheim 1945 interprets dvergar as brooches). But this is still open to debate. Blindheim sees the smokkr as a definite tailored garment, ankle length or even dragging on the ground. This idea of the length comes from the pictorial representations, and is not supported by the archaeology, which suggests a shorter, sleeveless dress with brooches, although there is no conclusive proof. Although diamond twill is the most common weave for women's dresses, the repped fabric found here is not unusual. For example, some of the fragments of loops in tortoise brooches (Birka grave 835) are similar to the Haithabu fragment. Geijer's classification identifies the Haithabu fabric as the W25-W28 type. The Haithabu find was clearly upper class, as indicated by the dye, the fabric quality, the tailoring and the fine stitching. It shows no trace of having been mended, and the dress was worn for some time after the hole was made in the top seam. This type of dress is thought to have been worn with bronze tortoise-brooches, which are found only in the richest graves.